Psalm 91 teaches us that God is our shelter. Do you need a refreshing? Are you tired of your everyday life? God wants you to experience New Life everyday! If you have been born again into God’s family, through faith in Jesus Christ as Savior, God has given you a wonderful BIRTHRIGHT... one of which is NEWNESS OF LIFE! It can be experienced every day of your EARTHLIFE! 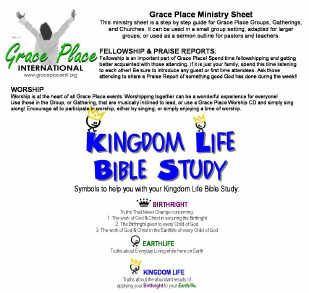 This Kingdom Life Bible Study will show you how to experience the NEWNESS OF LIFE that you have already received!